Stop focusing on what your business does and start promoting WHY you do it. Your friends don’t like you for what you do. They like you for who you are. The same is true for customers and employees. Many businesses have lost perspective, they know what they do, but have forgotten WHY. KEY TAKE AWAY: Rediscover your WHY and put the focus on that. Simon’s TED video has received more than 4.8 million views from around the globe, and his book hit the New York Times bestseller list. 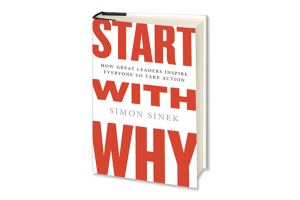 Sinek’s primary example in the book is Apple. Simon points out that Apple computers are more expensive than PCs and have less software available to use on them. So WHY do people buy them? Because they buy into Apple’s WHY. They buy into the Apple vision and will pay more for a computer that reflects their values. Simon says their products may not even be the best or first on the market, but they quickly emerge as the leader. Look at their marketing message starting with the WHAT. Apple would say – “We make great computers. They are beautifully designed, simple to use. Do you want to buy one?” – chances are you are not inspired by that. It does say what they do and how they are better in a typical marketing strategy. Any business can explain what it does; some can explain how they do it; but very few can clearly articulate WHY. WHY is not money or profit, quality products or services. Those are results. To discover your WHY you need to get personal, to get down into the grass roots. WHY does your business exist? WHY does it do the things it does? And WHY should anyone care?Knowing your “WHY” will help refine your strategy, branding, marketing, products and services. It will help you to differentiate your business and rise above the competition. In its simplest form, WHY is your purpose for creating the company. Sam Walton (Walmart) wanted to make quality goods affordable and available to rural USA. Herb Kellerman (SouthWest Airlines) wanted to take the stodginess out of air travel, and bring it to the common people. Bill Gates (Microsoft) had a vision of accessible information for all. Each of these men had a clear vision of a better future. Their company was not created to make money; making money was simply a benefit of realizing their visions. Before it can gain power or achieve impact, an arrow must be pulled backward, away from the target. That is where a WHY derives its power. It does not come from looking ahead at what you want to achieve. It is a process of discovery. WHY taps into people’s gut decisions. The limbic brain is responsible for all of our feelings, such as trust and loyalty. It is also responsible for human behavior and decision-making. When we communicate from the WHY, we’re talking directly to the part of the brain that controls decision-making, and our language part of the brain allows us to rationalize those decisions. For values or guiding principles to be truly effective they have to be verbs. It’s not “integrity,” it’s “always do the right thing.” It’s not “innovation,” it’s “look at the problem from a different angle.” Articulating our values as verbs gives us a clear idea … we have a clear idea of how to act in any situation. A WHY is just a belief. That’s all it is. HOWs are the actions you take to realize that belief. And WHATs are the results of those actions… everything you say and do: your products, services, marketing, culture and whom you hire. The next time someone asks, “Why should I do business with you?”… you say with confidence your WHY. Watch this video about how the WHY inspires TRUST. In this talk (30 minutes), Simon discusses the importance of trust, authenticity, and meaning. Make it about them, not you.